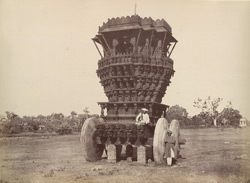 Photograph of a temple car at Banashankari, near Badami in north Karnataka, taken by Thomas Biggs in 1855, from Taylor and Fergusson's 'Architecture in Dharwar and Mysore'. The little town of Banashankari, a few kilometres away from Badami, takes its name from the goddess to whom a temple is built here. Banashankari is a fierce form of Parvati, the consort of Shiva, and her image enshrined here shows her as black and eight-armed and seated on a snarling lion. The goddess is particularly venerated by the local weaving community. The temple is said to have been built by the Chalukyas of Kalyana perhaps in the 12th century. The annual temple festival of Banashankari, in January-February, draws huge crowds and the streets surrounding the temple become part of a colourful fair. In India, during important religious festivals, the statues of the gods worshipped in the temples are carried on huge wooden chariots called rathas in a procession formed of the devotees. These chariots, up to five-six metres in height and weighing several tonnes, are pulled along on enormous wheels of solid wood by dozens of men. They are minutely carved with figures of gods and look like movable temples.